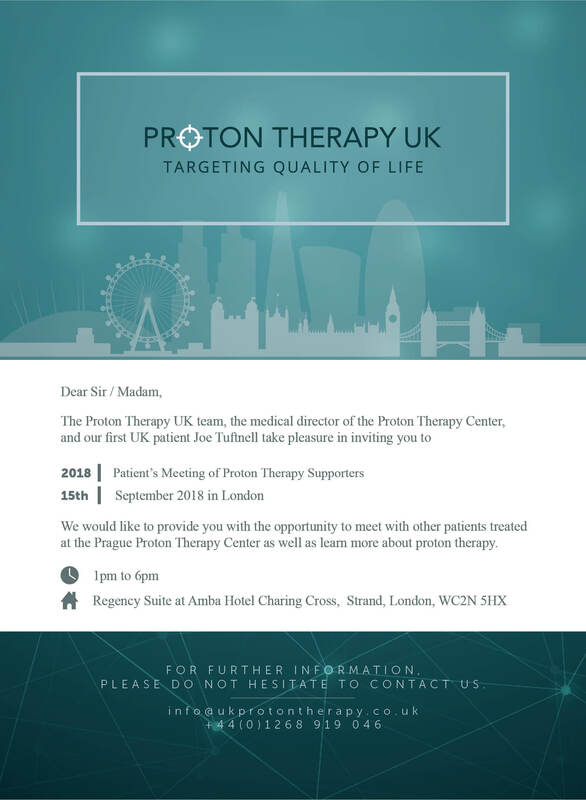 The third Saturday in September, the 3rd Annual Patients’ Meeting of Proton Therapy Supporters and medical professionals will take place in London. The event will be held in the Regency Suite at Amba Hotel Charing Cross. he initial idea of organizing a patients’ meeting was to bring together former patients treated at the Proton Therapy Center in Prague to share their experience and to get in touch with other people who went through the same struggle of dealing with the daunting diagnosis. Representatives of the medical team – radiology oncologists and physicists – presented the results of the clinic, explained the procedures in more detail and answered all the questions. This year we have also invited medical professionals from the UK, delegates of cancer charities and insurance companies. We would like to bring all the concerned parties together to discuss the benefits of proton radiotherapy and to make the treatment more accessible to everyone who needs it. 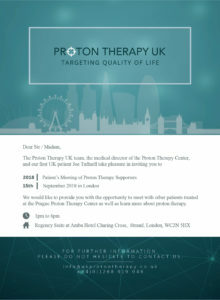 With the new proton centre recently opened in the UK, such an event as the Patients’ Annual Meeting, could be a great opportunity to address all related topics of proton pencil beam therapy. The capacity of the newly built proton centre in Manchester under NHS is limited and will not be able to treat all UK patients who are in need of proton treatment. These patients can be treated in proton centres abroad – including our clinic in Prague. We would like to take this opportunity to invite you to the 3rd Annual Patients’ Meeting. Come to London and listen to our former patients, find out about the proton therapy we offer, ask us about the things you wish to know – it may save your life or the life of your loved ones.